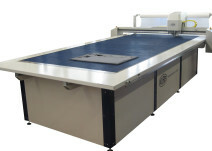 Automatic cutter for small sizes, ideal for samples and small or middle-sized items. The SK25 from Kuris Spezialmaschinen offers all advantages of a fully automatic CNC Cutter at a very attractive value for money. Due to the small dimensions of the cutter, the Starter Kit is ideal for small spaces. Sample cuts, small or medium sized series. The Starter Kit from Kuris is a perfect solution, if flexibility, efficiency and accuracy are required at a very convenient price. Based on the established Kuris Technology, this system offers all features, that can also be found in large cutting systems. The Starter Kit cutting height of up to 25 mm afford a wide range of applications. 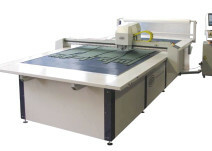 The cutting window with the dimensions 1,60 m x 3,40 m offers enough space for more cutting orders while the table dimensions are still very compact. It can be extended with modules of 2,40 m. The Starter Kit is the perfect system, if easy, fast and economic solutions are required.